Modern, detached holiday home just 800 meters from the sea, which is nice and close! 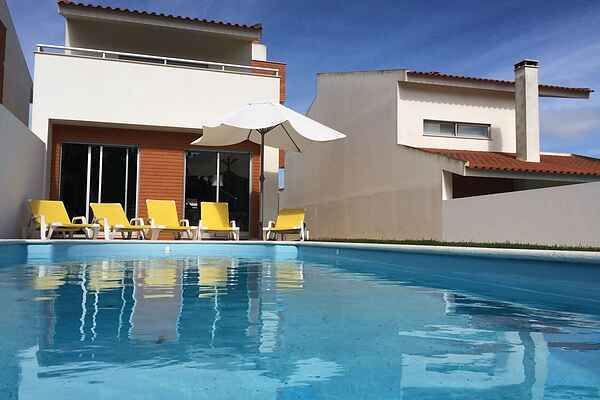 This holiday home on the Costa de Prata is fully equipped and of course the private pool is not missing. Sunbeds are waiting for you so you can enjoy the sun. The terrace with bbq is ideal for enjoying long summer evenings. With the Atlantic Ocean and a lovely long sandy beach only 800 meters you can fully enjoy the sun and beach. This nearest beach is located to the north of São Martinho do Porto but of course you can also go to São Martinho itself, then you have a few restaurants at the same time. The center is 3 km.Uw holiday home is very centrally located and a good starting point for many excursions. The fishing village of Nazaré is about 8 km away and is known as the perfect surf spot. The fortified town of Òbidos is about 20 km away and is an absolute must, make a walk over the city walls. The medieval basilicas and monasteries such as those in Alcobaca and Batalha are also easily accessible. The walker is already at home, in the vicinity of your house are many hiking trails.